This is a glimpse of the grand and unprecedented Cultural Revolution in China. This is a rational probe into the tragic history that influenced the entire nation and the fate of several generations of Chinese People. The book is the memories of 42 authors–most of them have directly and indirectly involved in the maelstrom of China’s Cultural Revolution. From different fields, different levels, different angles, they show the reader how for a full ten years this movement starting in the mid-1960s had distorted human nature and brought huge destructive impact on the political, economical, ideological, and cultural lives of the Chinese people. Some of these articles are descriptions of a scene, a close-up, a fragment; some are macro-recalling of history; some are meditations and rational discussions of what caused Cultural Revolution and what lessons we have learned from it. These articles also touch an extensive scope of people: the high government officials, the famous entertainment celebrities, the first Red Guards, and last but not least, the ordinary people. Almost all important stages of Cultural Revolution are reflected in these articles: the Red Guard movement, the Big Coalition, the violent turmoil throughout the country among major cities, the young intellectuals’ going-to-the-countryside campaign, "5·7" Road, etc. Moreover, some of the articles are about the rarely exposed secrets of Jiang Qin, Mao’s wife, and her "Model Bejing Operas"; the inside stories of Lin Biao, and the political jokes about Mao worshiping. Today, 40 years after Cultural Revolution, we bring up this disappearing history and anthologize all the reminiscences into a book. We hope the reader can experience or re-experience that unprecedented mania one more time in the new era and new space, so we can learn from the past and not make the same mistake. An unforgotten past is always the best guide for the future. 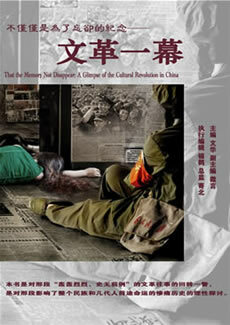 Therefore, the book is for all who would like to know or recall the Cultural Revolution in China and all who intend to research on this horrific event.